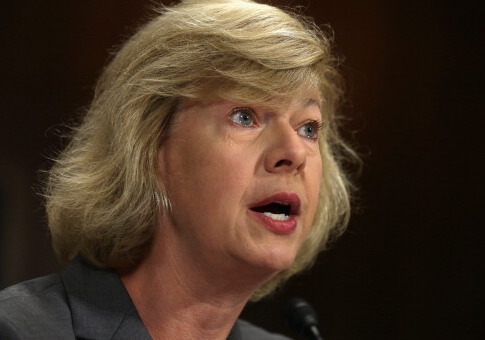 Sen. Tammy Baldwin (D., Wis.) has accepted over $86,000 from corporations that have used profits to reacquire portions of their own stock—the practice was denounced by Baldwin as "wrong" and a driving force behind "wealth inequality." Since the passage of President Donald Trump's tax cut package in December, which Baldwin opposed, the senator has seized on the issue of stock buybacks, an alternative form of returning money to shareholders, arguing that savings made available by the cuts should be invested back into the company and shared with workers. In March, Baldwin sponsored an amendment with Senate minority leader Chuck Schumer (D., N.Y.) to significantly "rein in" stock buybacks. The amendment would expand the powers of the Securities and Exchange Commission by allowing the agency the discretion to reject a company's attempts to repurchase its stock if a determination is made that such an action would "hurt workers." The amendment would require the SEC to "certify" that a buyback is in the company's "best long-term interest." In a statement released to accompany the amendment's introduction, Baldwin lambasted the "poor" decision making that results in buybacks as a driving force of "wealth inequality and wage stagnation." "It’s clear to me that the poor management decisions made by self-interested executives who are seeking short-term profits are driving wealth inequality and wage stagnation in our country," the senator said. "This amendment requires the SEC to do what I have been asking for years—provide stronger oversight of corporate stock buybacks." Baldwin's opposition to buybacks has led her to sponsor legislation, alongside Sen. Elizabeth Warren (D., Mass. ), to ban "all open-market" stock repurchases outright. The legislation, if enacted, would prohibit companies from reacquiring shares through the stock market. Baldwin's legislation would also mandate one-third of a corporation's board of directors to be directly elected by the company's employees. In explaining her reasoning for the bill, Baldwin expressed it was "wrong" for corporations to use savings afforded by the president's tax cuts for stock buybacks. The senator elaborated that banning "all open-market" repurchases out-and-out would prevent corporations from "hurting long-term economic growth." "Corporate profits should be shared with the workers who actually create value. It’s just wrong for big corporations to pocket massive, permanent tax breaks and reward the wealth of top executives with more stock buybacks, while closing facilities and laying off workers," Baldwin said. "The surge in corporate buybacks is driving wealth inequality and wage stagnation in our country by hurting long-term economic growth and shared prosperity for workers." Baldwin's strong stance against stock repurchasing has not prevented the senator from taking campaign donations from companies engaging in the practice as she faces a tough reelection battle this year. Financial disclosure forms filed with the Federal Elections Commission indicate Baldwin's campaign has accepted over $86,000 from at least 28 companies that have taken part in buybacks. One of those companies, the consumer goods giant Procter & Gamble, donated $2,500 to Baldwin's campaign only three days before the senator introduced her "open-market" ban on buybacks. In 2017, Procter & Gamble announced it would initiate "significant value return to shareholders" by reacquiring $22 billion of its stock. As Baldwin's campaign disclosures note, the senator has accepted $5,000 from the company's PAC for her reelection bid. Another contributor, General Motors Company PAC, donated heavily to Baldwin only months after unveiling its own buyback plan. In January 2017, the GM board of directors disclosed they would repurchase $5 billion of the company's stock. After declaring its intention, the corporation's PAC made two donations, one in June and another in September totaling $2,500 each, to Baldwin. GM PAC donated a further $5,000 to her campaign in January 2018, not long after it was reported the company would see large savings because of the very tax cuts Baldwin opposed. Overall, GM PAC has donated $10,000 to bolster Baldwin's reelection bid, according to FEC disclosures. It is unclear if Baldwin has plans to return any contributions from the 28 companies in question or if the senator will refuse such donations in the future. Baldwin's campaign did not return requests for comment on this story. Baldwin has not followed the lead of her fellow Democrats, including senators Cory Booker and Kirsten Gillibrand, in disavowing corporate PAC contributions for her campaign. This entry was posted in Politics and tagged 2018 Election, Securities and Exchange Commission, Senate, Senate Democrats, Tammy Baldwin, Tax Reform, Wisconsin. Bookmark the permalink.